Microsoft Zune HD is all set to hit the stores on September 15, to begin a new era of war with Apple’s iPod line up, this time taking it on with the iPod Touch. Microsoft has priced this well below the iPods and that can seriously damage Apple’s interest. In fact, rumours say that Apple is planning to come out with a new iPod Touch HD to combat the rise of Microsoft in the Personal Media Player sector. Many of us believed that select BestBuy stores in the US will have special Zune HD Preview for the fans, but in the end it is a baseless rumour. Hold on, we have something good happening this weekend on the Zune HD front. 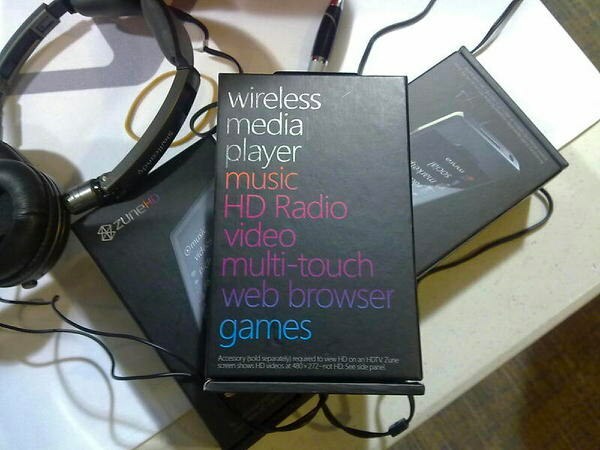 Apparently, the Zune HD Box has been leaked! Take a look at it. If you notice, the last line says ‘Games’. If the box is real, this little wonder can be more than a Personal Media Player. The USP of Zune HD is that it has the capability to play 720p HD Videos when plugged into an external display through the dock, apart from playing the usual MPEG and .WMV on the player itself. But the highlighting feature of the new Zune HD is the iPod like multi-touch navigation on a 3.3 inch 16:9 OLED touchscreen display with 480x272px resolution. Microsoft Zune HD also features an integrated HD Radio receiver, Wi-Fi, a built-in accelerometer, a web browser, and a touchscreen QWERTY keyboard. 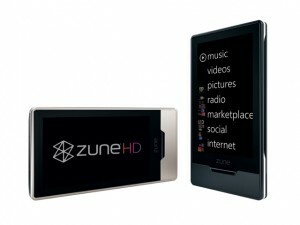 Zune HD will be available in two variants – 16 GB and 32 GB, priced at $219 and $289 respectively. It comes with a Nvidia Tegra Chip, believed to be a beast when it comes to processing media content. It can deliver a rich gaming experience some time, if not on the first release itself. The battery life of the Zune HD is expected to be 33 hours for music playback and 8.5 hours for video, giving it a significant advantage over the iPods.